The hatchback that aspires to be an SUV. A decade ago, if someone were to ask a Mahindra official whether they would create a rival to the then newly-launched Maruti Swift, I bet they would find the idea hilarious. At that time, Mahindra had a strong brand image for making butch utility vehicles, and enjoyed watching the Mahindra Scorpio dominate the SUV segment. However, if a manufacturer is looking to grow its volumes in the Indian automotive market, they will have to tap into the highly competitive hatchback segment. For instance, look at the Renault Kwid. Thanks to its success, a manufacturer with only a decade of experience in the Indian market managed to increase their market share by more than double (from 2% to 4.5%) in a short amount time, garnering over 1,00,000 bookings in India alone. The Ford Figo is another example, without which Ford would have been a fringe player. Given that Mahindra were feeling the heat from SUVs like the Duster and the EcoSport that are eating into the sales of its established products, the Indian manufacturer had to create a product even smaller than the Quanto and TUV300 to balance the scales, a Mahindra that could have prospective customers veering from hatchbacks like the Maruti Swift, Hyundai Grand i10, and Ford Figo. Ladies and Gentleman, meet the Mahindra KUV100. The KUV100 managed to secure 21,000 bookings since its launch. 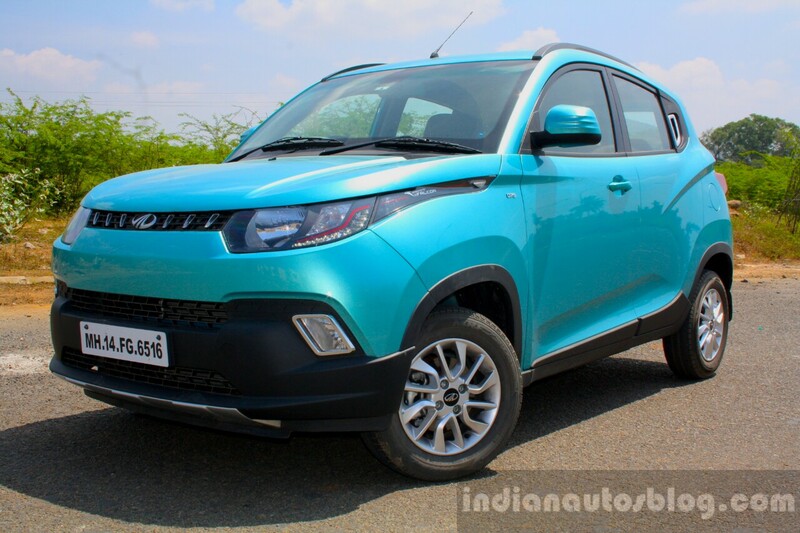 It's clear that Mahindra wanted to preserve its brand image as a utility car manufacturer by designing the KUV100 around the proportions of an SUV. Not only is it Mahindra's smallest product to date, but also one of the most advanced as it debuts an all new engine range developed with Ssangyong and a new monocoque platform, both of which will make it into future products. 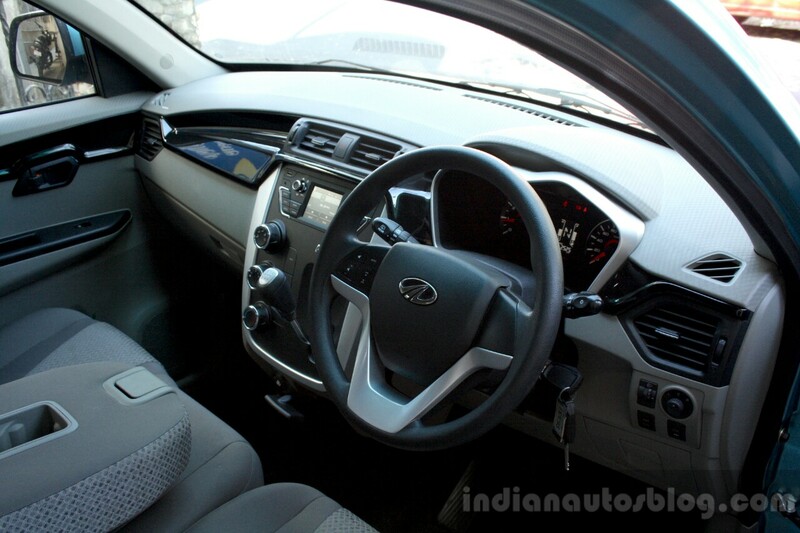 The exterior of the Mahindra KUV100 draws a mixed bag of opinions. While some of the design elements look contemporary and incite curiosity, the execution of the overall styling in under four meters isn't pleasing to the eye. Since the KUV100's unique appeal incites curiosity among petrolheads, I've had to give brief walkthroughs to many people. 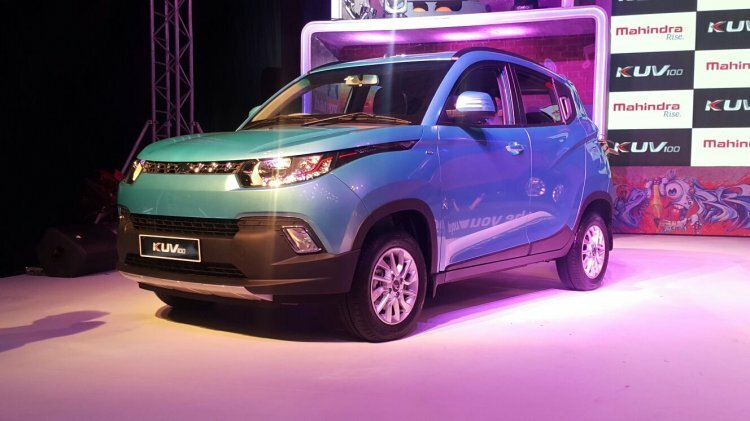 Mahindra wanted the KUV100 to look like a unique mini SUV, a bodystyle that appeals to the Indian masses. It sits tall, has generous wheel well space, black plastic bumper and side sill extensions, and roof rails. 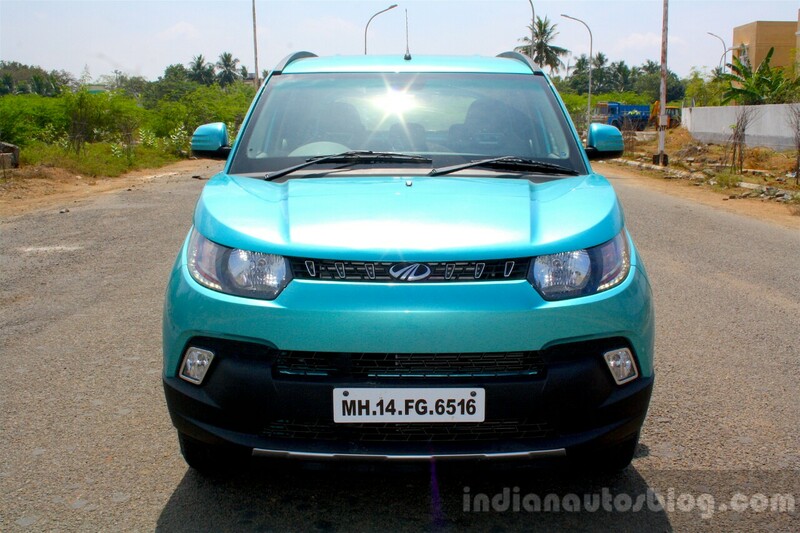 However, this has made the KUV100 look squat and disproportionate. 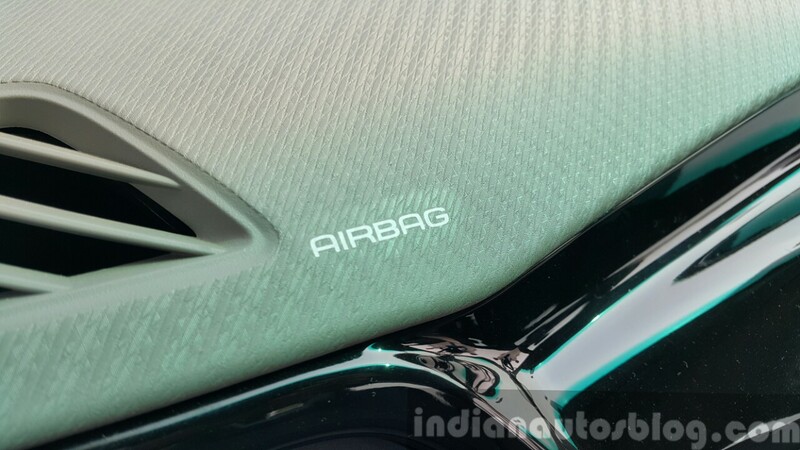 The front end tries to convince you that it's an SUV, featuring an XUV500-inspired clamshell bonnet, large swept-back headlamps, black plastic bumper contrasted by a silver skid plate and foglamps. The headlamps have neat LED DRLs integrated, and extend all the way across the front wing, giving it a "sunglass" look (as Mahindra claims). The front end of the KUV100 tries to convince you that it's an SUV. Once you step towards the side, questions start to raise. Is it an SUV? Is it a hatchback? Top-end variants ride on 14-inch alloy wheels shod with tubeless 185/65 R14 MRF ZVTS tires, which are tiny for a design as bold as the KUV100. Mahindra's fascination for sculpted features can also be seen in the side profile, with strong slashes from both ends that break up the surface. Entry handles for the rear passenger doors are located on the pillar, so that the crease from the rear-end smoothly flows into the side profile. 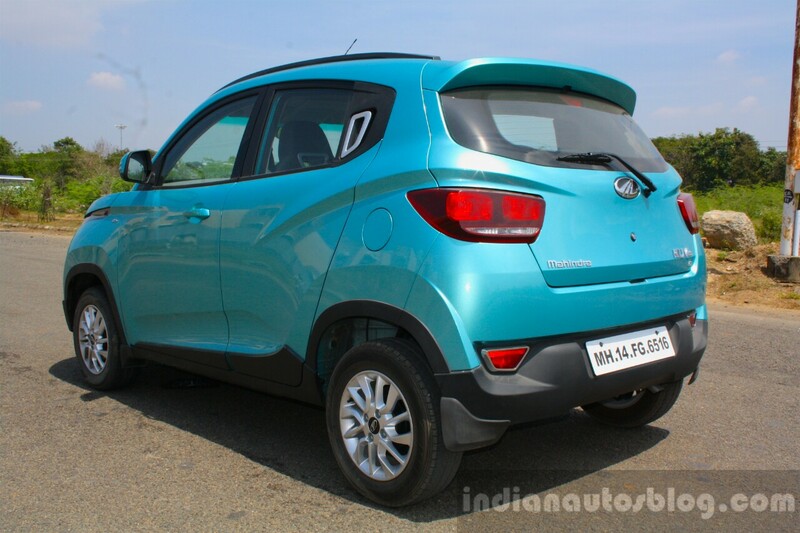 From the rear quarter angle, the KUV100 looks squat and disproportionate. The squat design is further exemplified by the rear-end that has one of the shortest overhangs I have ever seen in an "SUV". With the large pair of taillamps and the crease line, the windshield is kept short and wide, which has affected the rear visibility. Also, the boot opening isn't as wide as expected for a car that is wider than its rivals. Once you step inside, the positives of the Mahindra KUV100 start to roll in. 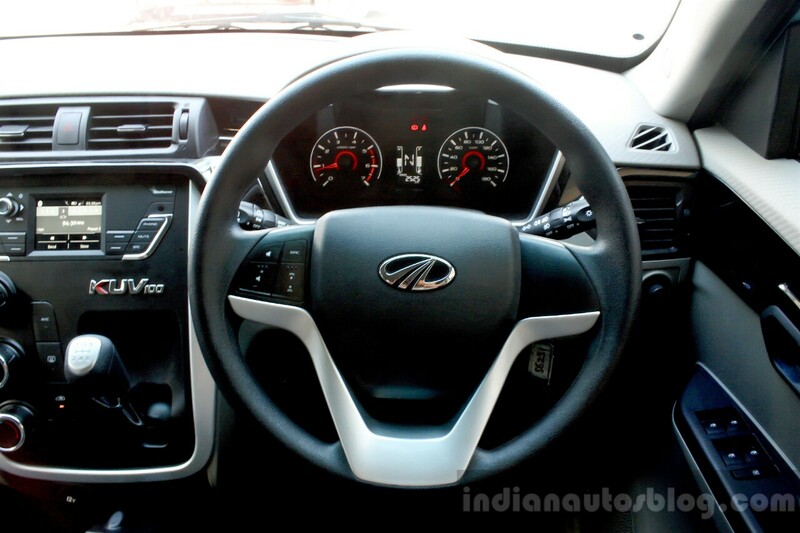 The KUV100 has one of Mahindra's nicest interiors yet. Since the KUV100 is taller than its competition, entry and egress for large people is easier. 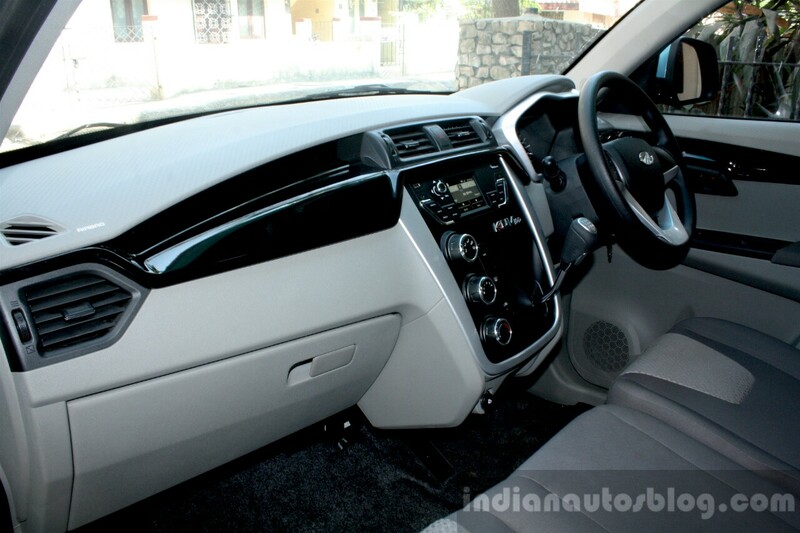 Step in, and you're greeted to one of Mahindra's nicest interiors yet. 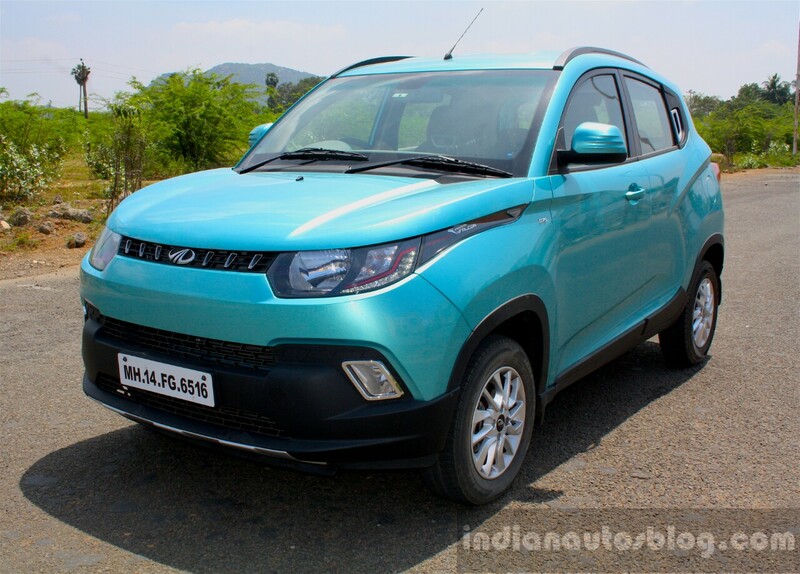 For an entry-level Mahindra that starts from INR 4.42 Lakhs (ex-showroom), the quality of plastic and color combinations used are better than its bigger, more expensive brothers. Every button and dial is tactile and firm, and no plastic trim rattles during idle rpms. The quality of plastic and color combinations used are better than its bigger, more expensive brothers. The first thing that catches your eye is the gear lever, which may look awkwardly positioned on the wide and large center console. However, it is perfectly placed for the driver, and has a grippy rubber knob that makes it easy to shift. Also, the KUV100 adopts a Datsun GO-inspired parking brake lever that sits underneath the gear lever on the center console. The gear lever is perfectly placed within the reach of your palms. Why is the gearbox and handbrake on the center console in the first place, you ask? It is to leave space for a seat that can accommodate a "sixth" passenger. 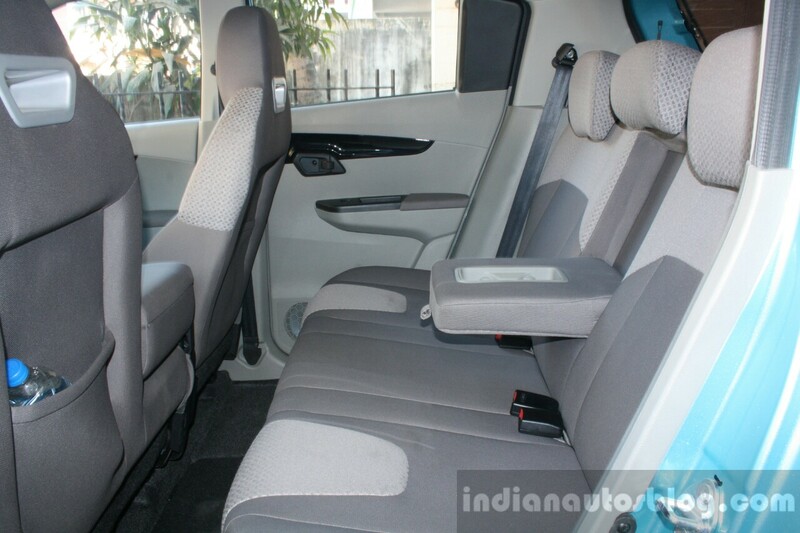 Yes, the KUV100 marks the return of the 5+1 seating arrangement, where the space between the driver and front passenger is fitted with a foldable jump seat that can also double as a large armrest with two cupholders. The KUV100 marks the return of the 5+1 seating arrangement, which could be a boon for taxi operators. However, there is very little kneeroom between the seat and center console, thus being only able to accommodate a small child who would usually sit on a passenger's lap in a regular car. 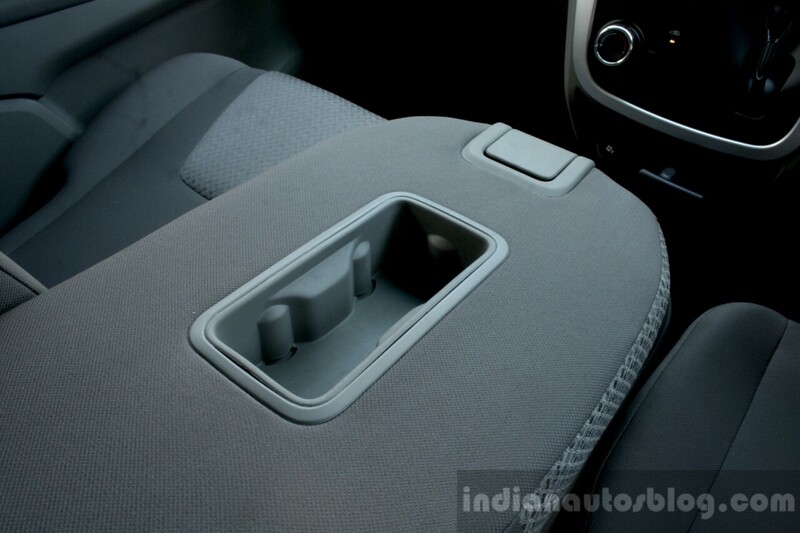 Mahindra themselves acknowledge that the front middle seat is a last resort. The "sixth" seat is much better off as a large armrest/cup holder. 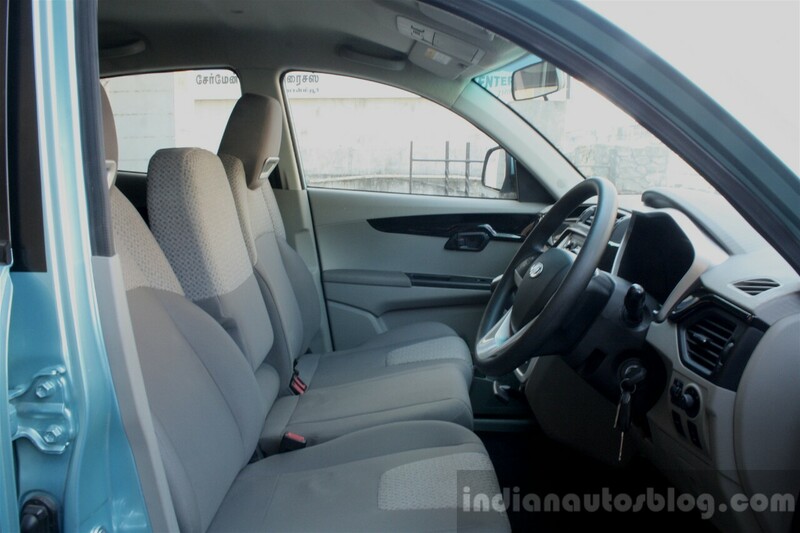 As discussed in my review of the petrol variant, the seats in the Mahindra KUV100 aren't as comfortable as I had expected, and proved strenuous while driving for long hours. 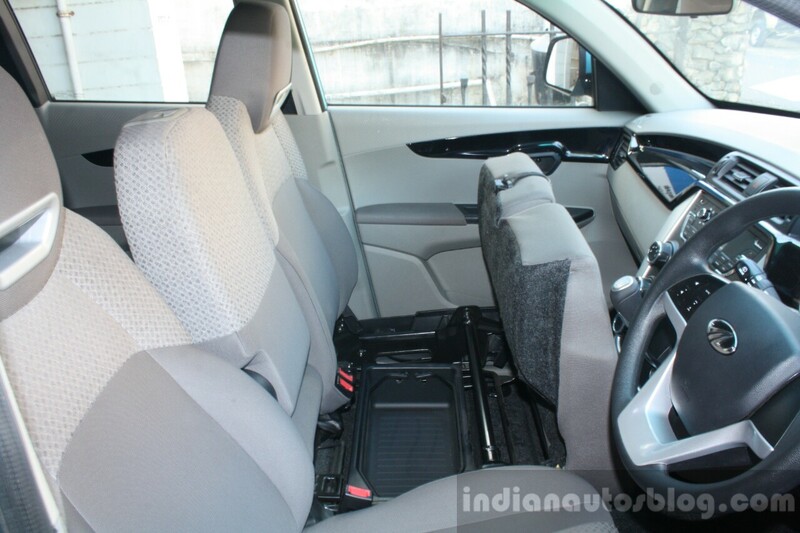 However, the amount of space available for passengers is a strong USP in the KUV100. With a floating dashboard and a center console placed closer to the driver, the front passenger gets to enjoy good legroom, while headroom is fairly decent for all passengers. The rear cabin is more spacious than its rivals, featuring cleverly sculpted front seats and a flat floor for improved legroom. 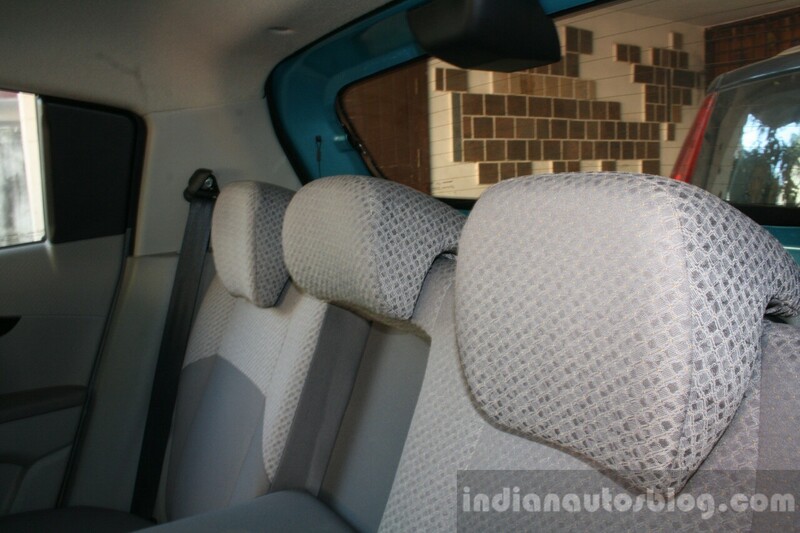 The rear cabin of the Mahindra KUV100 is more spacious than its rivals. 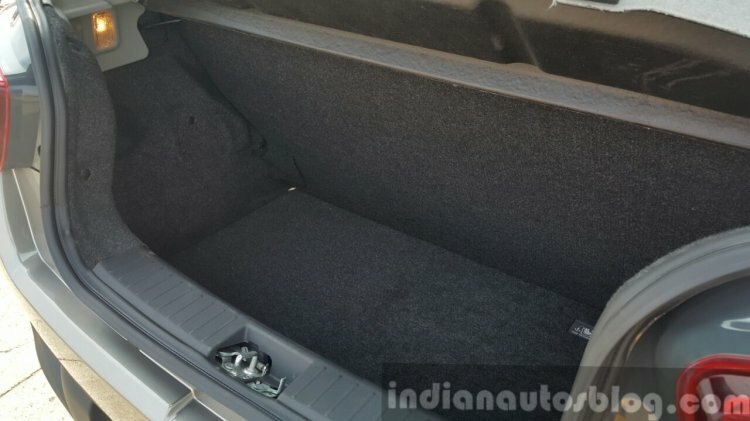 The KUV100 has secret storage points in the cabin. One of them is located under the front seat, which can be accessed by lifting the seat cushion, while the rear cabin has a secret space on the flat floor. So if you want to hide that secret gift for your loved one, among other things, you'll know where to keep it. Speaking of storage, the Mahindra KUV100 has a boot capacity of 243 liters, which is more than that of the Maruti Swift (210 liters), but less than rest of the competition. The boot volume is deep, and wide, but has little breadth for better rear seat spacing. It's good enough for the groceries, although a pet is definitely not going to get in there. The boot volume is deep and wide, but has little breadth for better rear seat spacing. Visibility is only average in the KUV100. The driver sits taller than most hatchbacks for a commanding view, although the rear visibility is quite hopeless. The small windshield and thick C-pillars make it tough to reverse the car into tight spaces, unless you have parking sensors, which are not available in the top-end K8 grade. The small windshield and thick C-pillars affect rear visibility. The K8 grade we tested had decent levels of equipment. It features a 6-speaker Bluetooth-enabled music system with speed-sensing volume control, steering mounted audio controls, electrically-adjustable wing mirrors, rear armrest, follow-me and lead-me lights, a rear wiper/washer, and an XUV500-inspired ambient lighting. 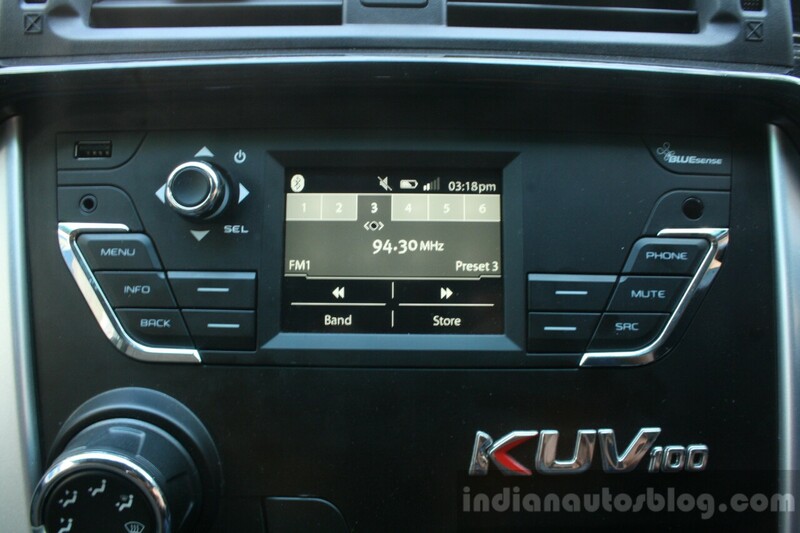 The KUV100 comes decently equipped with a 6-speaker Bluetooth-enabled music system, speed-sensing volume control, and steering mounted audio controls. The manual HVAC settings are arranged vertically along the center console, and did a great job of cooling the cabin that trapped Chennai's infamous heat. However, despite setting the aircon's airflow to hit my face, the HVAC system was directing cool air to my feet as well, leaving it uncomfortably chilled in long journeys. This defect may be specific to the unit we tested. If the exterior and interior of the Mahindra KUV100 hasn't been impressive, the engine and gearbox will be. 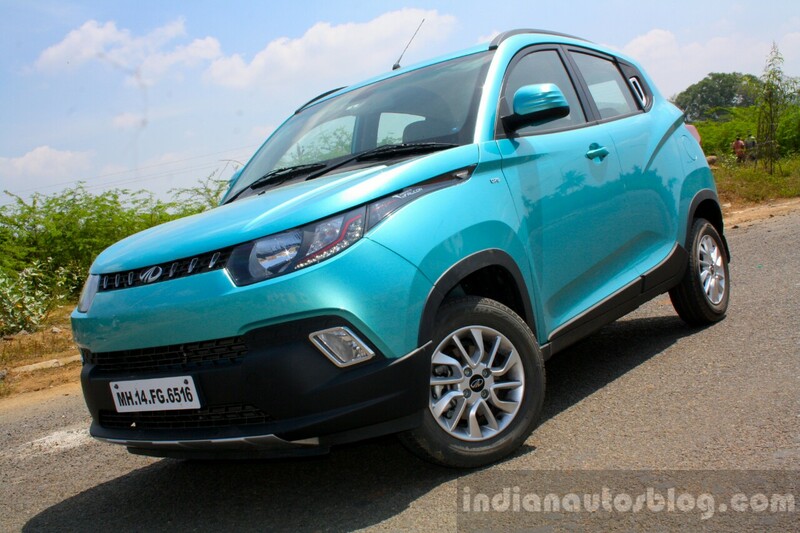 In short, the KUV100 has one of the best powertrains Mahindra has installed till date. 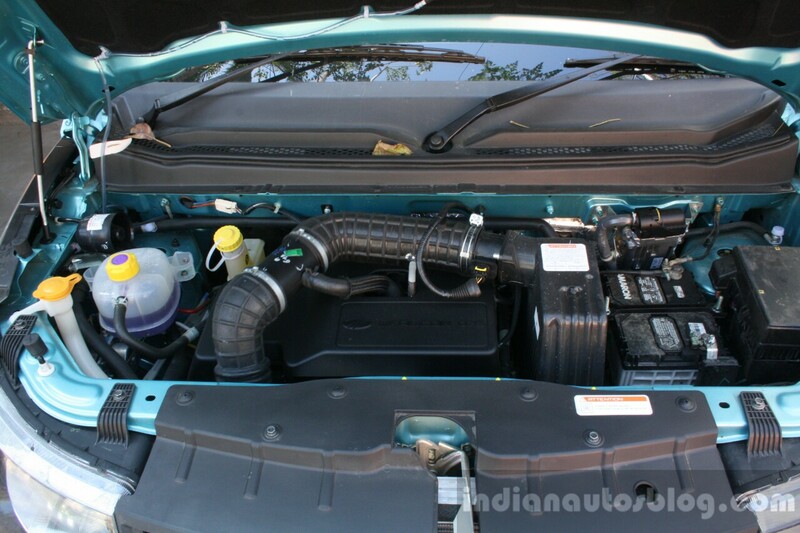 The KUV100 has one of the best powertrains Mahindra has installed till date. 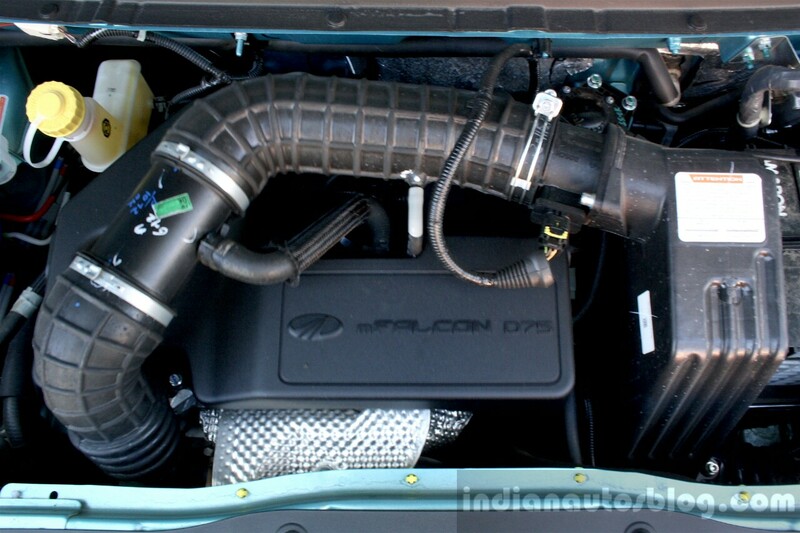 The engine powering our test car was a 1.2-liter (1,198 cc) three-cylinder mFalcon turbodiesel engine (codenamed D75), which is capable of producing 77 PS at 3,750 rpm and 190 Nm from as low as 1,750 rpm. This is an all new engine from Mahindra that is co-developed from scratch with Ssangyong, which will make its way into more products in the foreseeable future. After driving both the 1.2-liter G80 petrol and 1.2-liter D75 diesel, I would go for the latter option in a heartbeat. While the petrol variant felt relaxed and well-refined, it doesn't eat up the miles nor feel as eager as the diesel variant. 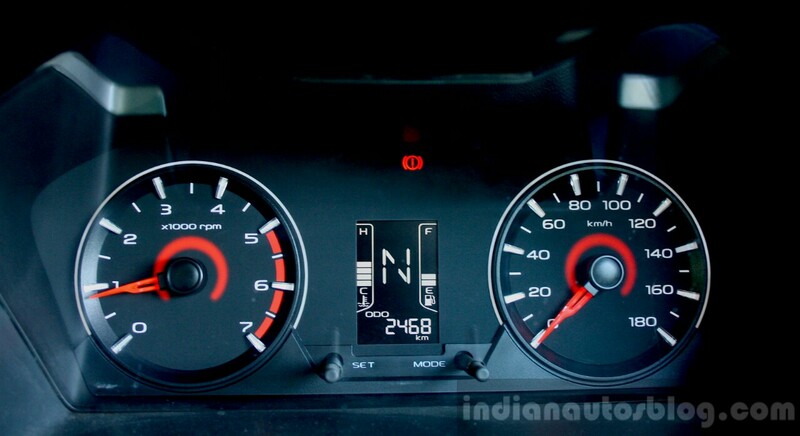 Turbo lag is minimal under 1600 rpm, which enables brisk take-offs from standstill or quick overtakes at low rpm. Once the turbo spools from 1,750 rpm, the car lunges forward in a linear and refined manner, before it runs out of breath at 3,700 rpm. With compact dimensions and a peppy diesel engine, the KUV100 is good for a quick scamper around cities. Turbo lag is minimal under 1600 rpm, which enables brisk take-offs from standstill. However, the biggest improvement has to be the new 5-speed manual gearbox. Mahindra has finally heard owners' calls by installing a gearbox that shifts smoothly with short throws, thus ending the long run of notchy manual gearboxes. If you're into the occasional brisk accelerations like me, the KUV100 will not fail to impress. 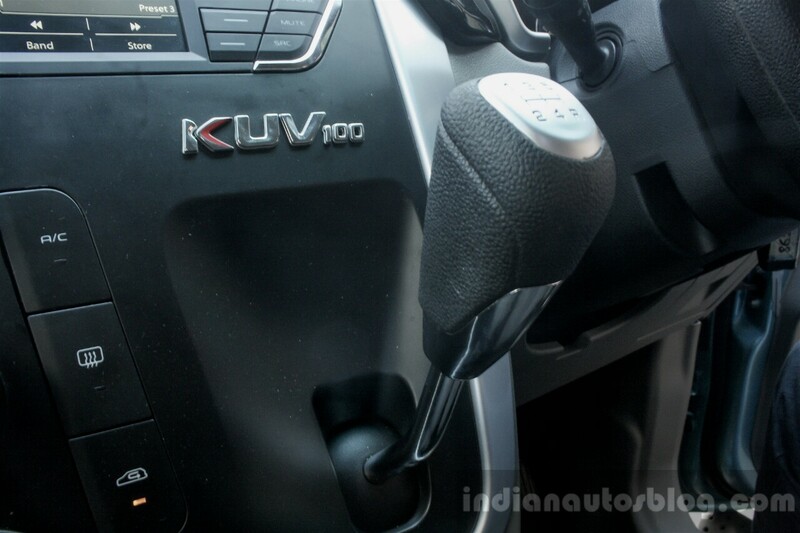 Clutch pedal actuation in the Mahindra KUV100 hits the sweet-spot - it's neither too light nor heavy. Biting point is easily predictable when you're driving it for the first time, allowing for precise movements. Enabling ECO mode will drop the engine response to a level where you feel like the turbocharger fell off the car. 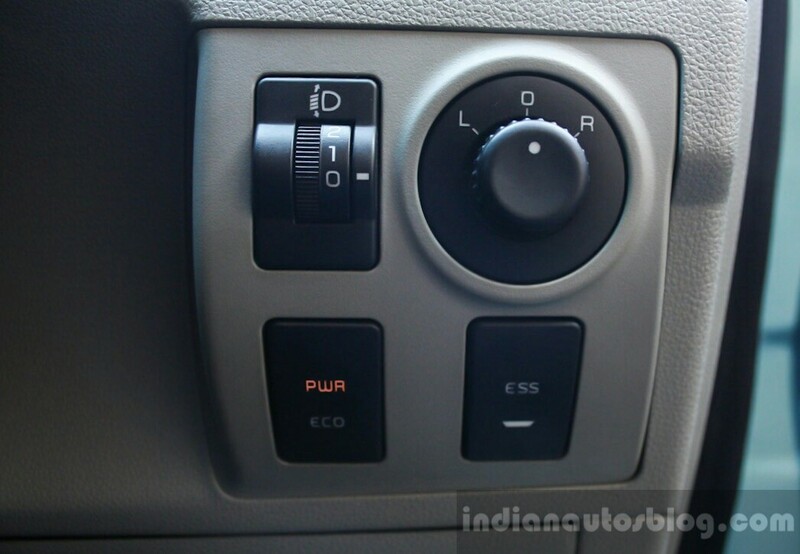 The diesel variant comes standard with PWR (power) and ECO driving modes. 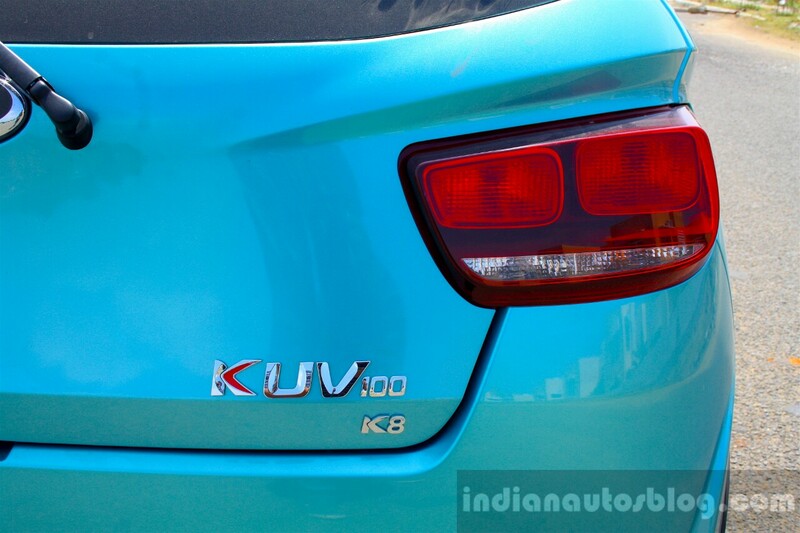 By default, the KUV100 will run in PWR mode and exhibit the characteristics discussed above. Enabling ECO mode will drop the engine response to levels where you feel like the turbocharger just disappeared; delivering torque in a restrained manner. The purpose is to prompt the driver to shift early for higher speeds. Speaking of fuel efficiency, the Mahindra KUV100 diesel variant is capable of returning a fuel consumption of 25.3 km/L (ARAI certified), which is a competitive figure. With a light foot, I managed to keep the fuel efficiency between 20-21 km/l, while a fast highway run could drop it down to 14 km/l. However, Mahindra could've fitted a fuel tank bigger than 35 liters to cover more kilometers. During its product presentation, Mahindra stated that the KUV100 has a long travel suspension setup for better ride quality over bumpy roads. As it turns out, the KUV100 does have a pliant and comfortable ride, soaking jerks from small potholes and road undulations like a proper SUV. While it may instill confidence, be aware that the KUV100 only has an hatchback-like ground clearance of 170 mm. The KUV100 has a pliant and comfortable ride, soaking the jerks from small potholes and road undulations. The soft suspension may have affected its handling characteristics. Driving around the sharp hairpin corners towards Yelagiri, I found that the body roll and understeer can be a bit nerve-wracking. 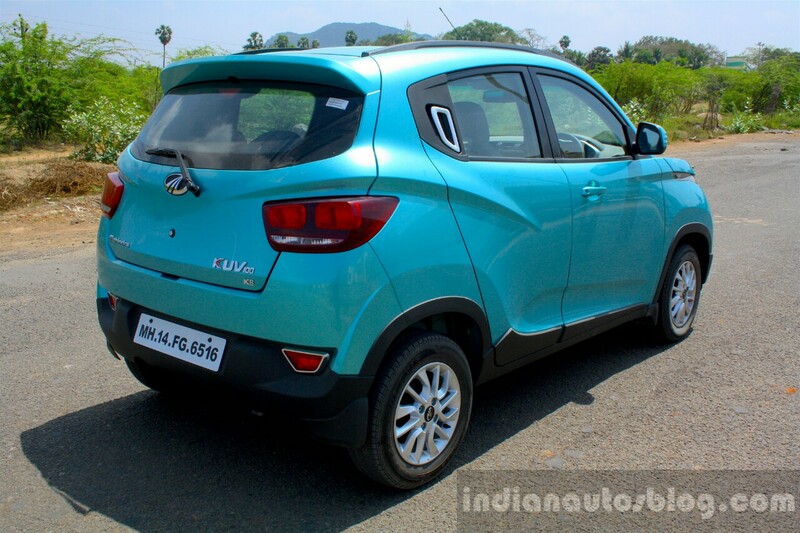 Given that the KUV100 is not developed to be a cornering machine, its handling capability isn't too much of a bother. The steering wheel is small and feels ordinary. The EPAS is light-weighted, which makes for effortless maneuverability around city traffic. The brake pedal isn't very sensitive, but the brakes themselves have plenty of bite with good stopping power. Given the increase in awareness towards occupant safety in India-made cars, Mahindra has taken the first steps in ensuring that its products meet current and future safety norms. A driver and front passenger airbag is optional in all grades. The new monocoque platform consists of ultra-high strength steel for better structural rigidity, and features such as ABS with EBS and ISOFIX child seat mounts are standard across all variants. Driver and front passenger airbags are optional in all grades. The Mahindra KUV100 was launched for sale in the Indian market on January 15. Interestingly, it's also available to book online in Flipkart for a deposit of INR 10,000. The Mahindra KUV100 was launched for sale in the Indian market on January 15 at prices starting from INR 4.42 Lakhs. Now we come to the hardest part of any review - the tester's final impressions of the Mahindra KUV100. The variant tested was the K8 grade of the diesel variant, which starts from INR 6.76 lakhs (Ex-showroom). The Mahindra KUV100 is a one-of-a-kind hatchback that aspires to be an SUV. If you're looking to turn heads (in the quirky manner), the KUV100's design is apt as it incites curiosity and attention. The seat comfort could've been better, while rear visibility and boot volume aren't satisfactory. The Mahindra KUV100 is a one-of-a-kind hatchback that aspires to be an SUV. However what we have here is one of the most refined Mahindras ever built. It's got an impressive diesel engine, slick gearbox, well-trimmed and spacious interior, and a commanding view over its rivals. The cherry on the top is its competitive pricing, which is slightly lower than the competition.